VERIFY: Did independent review find Charlottesville responsible for Unite the Right violence? 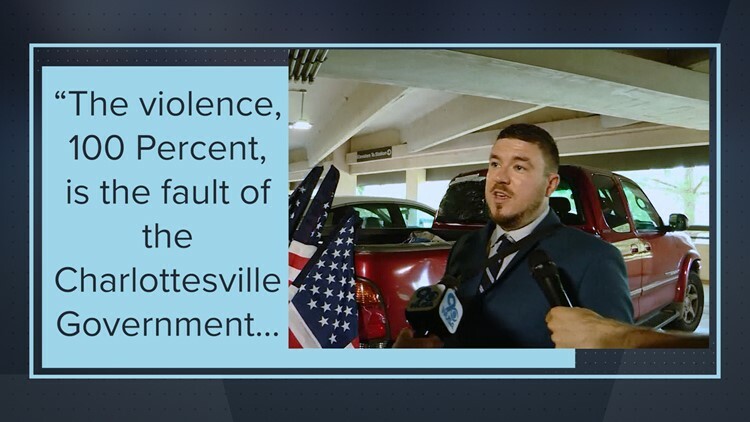 A Unite The Right organizer claims an independent review found the violence in the 2017 Charlottesville rally was the city government's fault. We checked into the claim. Before he boarded a metro train to the "Unite The Right" rally in downtown D.C., Sunday, Organizer Jason Kessler stopped to talk about his motivations. 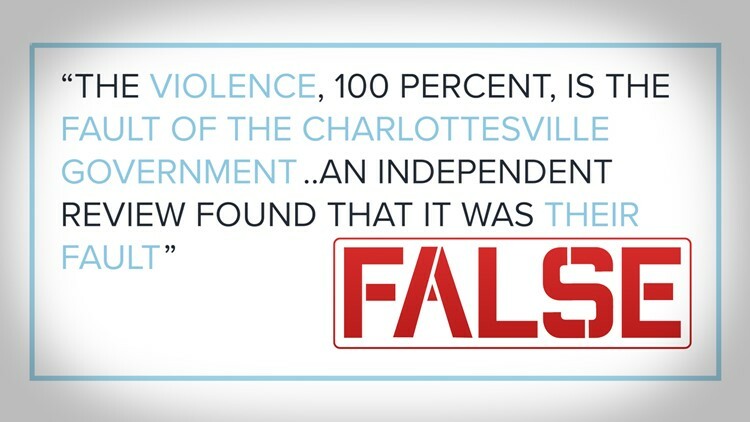 When asked about the violence at the rally in Charlottesville in 2017, Kessler said: "The violence, 100 percent, is the fault of the Charlottesville government last year... an independent review found that it was their fault." Is Kessler's claim right? Did an independent review find the Charlottesville government responsible for the violence last year? No, an independent review was conducted, and it did find a multitude of mistakes and errors by Charlottesville agencies, but it did not ever attribute blame or fault to the city or police department. In more than 200 pages, former U.S. Attorney Timothy Heaphy and his team of lawyers broke down the rallies in Charlottesville earlier in 2017 as well as all the events and groups involved in the Unite The Right rally in August. "-CPD commanders did not reach out to officials in other jurisdictions where these groups had clashed previously to seek information and advice. --CPD supervisors did not provide adequate training or information to line officers. --CPD planners waited too long to request the assistance of the state agency skilled in emergency response. --CPD command staff also received inadequate legal advice and did not implement a prohibition of certain items that could be used as weapons. --CPD devised a flawed Operational Plan for the Unite The Right rally." While the report did find a number of flaws and missteps in the handling of the situation, the authors never once laid the blame on the city or said they were responsible for the violence. Additionally, Tim Heaphy, sent Verify this statement when we reached out for commet. "Mr. Kessler’s assessment is inaccurate. Our report identified clear failures of the local government in Charlottesville, which hired us to do the independent review. That said, many other people and entities share the blame for the violence at last year’s rally, including Mr. Kessler himself. Mr. Kessler obtained the permit for the 2017 Unite the Right event, invited other participants, and organized the activities of others before and during the event. Many white nationalists who attended the Unite the Right event instigated violence and assaulted peaceful protesters, conduct which has resulted in numerous criminal charges. While the City of Charlottesville made significant mistakes last summer, it is false to lay the blame for the violence that occurred solely at the feet of government."